A visit to Hawaii wouldn’t be a VISIT to Hawaii without sampling some quality, authentic Hawaiian food! If you book a luau, such as the Chief’s Luau, through Hawaii Aloha Travel, you’ll be treated to a delicous Hawaiian buffet, complete with all the Hawaiian food you can eat. But, for those of you skipping the luau scene, you’ll need to find your own Hawaiian food. So, where do you start? We’ve put together a short list of our 3 top picks for great Hawaiian food on Oahu, so you can eat like a local! 1. Ono Hawaiian Foods: Located on Kapahulu Avenue, you’ll find that Ono Hawaiian Foods is about as authentic as it gets! The Kalua Pig Plate comes with Kalua pig, pipikaula, lomi salmon, haupia, rice, or poi (small), and the Chicken Long Rice plate features chicken long rice, pipikaula, lomi salmon, haupia, rice, or poi. Ala carte items include laulau, pipikaula, naau puaa, squid luau, and butterfish luau. You may not immediately recognize these unique dishes when they’re served, but give them a whirl anyway — this is how locals have eaten in Hawaii for hundreds of years. 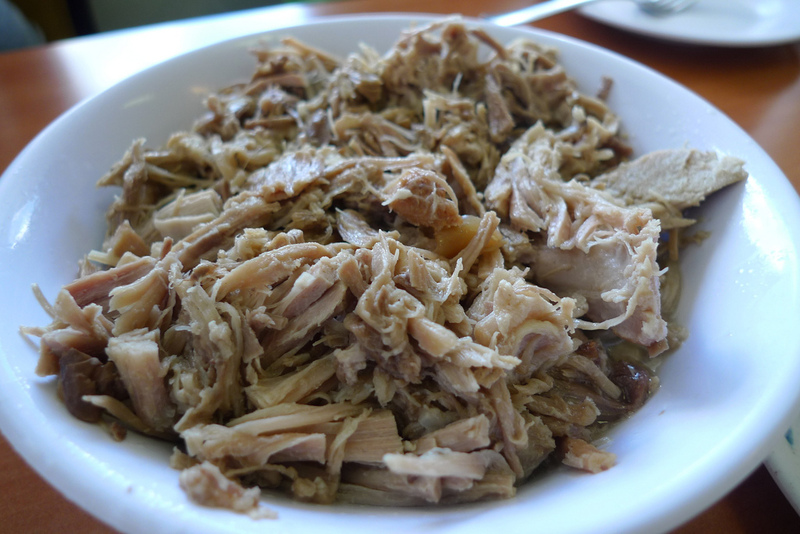 Kalua pig is an island classic. Often it's the cornerstone of any luau, but is also often found at many local eateries. 2. Haili’s Hawaiian Food: Haili’s Hawaiian Foods opened in 1958 and has been providing traditional Hawaiian food ever since. The restaurant says its uses only the freshest ingredients and honor the culinary lessons that have been passed from generation to generation in the family. Try the Big Kahuna, which features Kalua Pig, Laulau (Pork or Chicken) and Chicken Long Rice. Includes Lomi Salmon, Poke, Haupia, Rice or Poi. Or give the Kalbi or Pulehu Steak & Chicken Long Rice a whirl. It Includes Lomi Salmon, Poke, Haupia, Rice or Poi. A nice addition to the menu are the Hawaiian bowls. Choose from fried or raw poke, kalua pig, laulau (pork or chicken), pastele stew, or chicken long rice served with one scoop of rice, or sweet potato. 3. Yama’s Fish Market: Here, you”ll find local favorites and Hawaiian dishes that will make you REALLY feel like a local. Choose from assorted Poke, Lomi Salmon, Kalua Pig, the restaurant’s signature Lau Lau, daily specials, and homemade Haupia, Cookies, and a variety of other desserts that will, as they say on the website, “broke da mouth”! 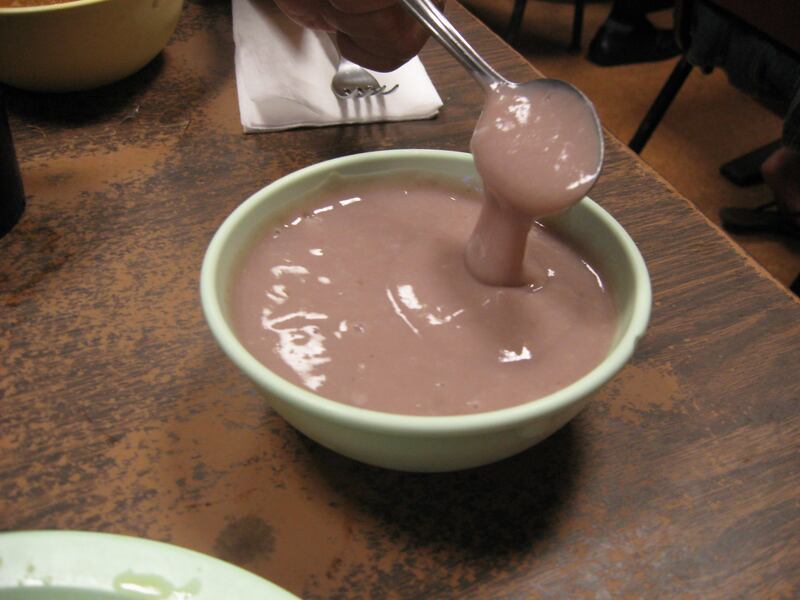 Poi is a pasty starch that is the staple of traditional Hawaiian meals. It' s made from the corm of Taro plants. Menu items include laulau, Kalua pig, lomi salmon, beef stew, and macaroni salad, plus local plates, such as beef teriyaki, kalua pig cabbage, and grilled ahi. Don’t forget to consider ordering a bento if you’re on-the-go — some feature rice, Mochiko Chicken, Beef Teriyaki, Teri Hot Dog, and Takuan, while others offer-up rice, Stir Fry Tofu, Shoyu Eggplant, and Namasu. Authentic Hawaiian food isn’t for every palate, to be sure. But, you may find yourself pleasantly surprised at how delicious locals have been eating for hundreds of years! So, try some of this Hawaiian food on Oahu during your next visit, and you’ll be a believer in no time!